Bright eyeshadow and sparkle eyeshadow are so much fun to apply, especially around the holidays! Expand your beauty horizons with bright makeup and trendy colors. Bright makeup isn’t something most of us wear every day, but on certain occasions it can be perfect. Halloween parties, St. Patty’s Day parties, the Fourth of July, birthdays, and even themed parties provide a great opportunity to break out your colors and create a unique makeup look. These photo eyeshadow ideas should give you a couple of starting points for creating a customized look for your event. This look is one of my favorites for a few different reasons. Its earth toned colors bring out a lot of the color in your eyes, making them appear even brighter. It is also very festive because of the three tiered outer wing, something you won’t find on someone else in the crowd when you arrive! The best part about this look is that its colors will complement any eye color except blue, so don’t be afraid to give it a try! This look would work well anytime during the fall, especially around Thanksgiving. I also get a bit of a Cowboys & Indians vibe from it, just in case your group of friends starts an epic battle of the Old West! I used four different bright eyeshadow colors and eyeliners to create this look. Surprisingly, both the top and bottom eyeliner were dubbed “copper” on the package. As you can see, they are both quite different. 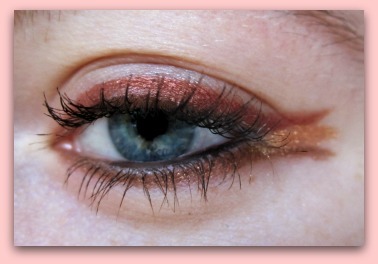 The red-gold eyeliner I wore on top is a NYX Slim Eye Liner Pencil 923 Copper (Perfect for bright eyeshadow) . The bottom is a Wet N Wild 157 Copper Eye Pencil The true gold eyeshadow between the two liners is Nyx Oro Loose Shimmer Powder . I lined my upper and lower lashes with the coppers first, making the upper line a bit thicker for extra pizazz. Once this was done, I took an eyeshadow brush and carefully dabbed the gold eyeshadow between the two copper wings. Then, I simply lined my waterline in black matte and added mascara to complete the look. This style is very easy once you get used to using eyeliner and creating wings, but fortunately it looks as if it requires a lot of skill to attain. This look uses five shades of eyeshadow and a tube of mascara to complete. You will want to have both an eyeshadow brush and a small fluffy blending brush on hand when you begin. I used a light green, a deep cerulean blue, an olive green, and a gold-orange eyeshadow in this photo. I love these mermaid colors and their shimmer. Sparkling eye shadow can really look great on special occasions. Start by sweeping the olive green eyeshadow beneath your lower lash line for definition. Then, clean your brush and apply the gold to the inner corner of your eye, blending outwards towards the center of your eyelid. Wipe off your brush again and pat the sea green color onto the center area. Don’t worry about blending right now, you can do that at the end. Dip your brush in the deep blue and use it to create a sideways V at the outer corner of your eye. 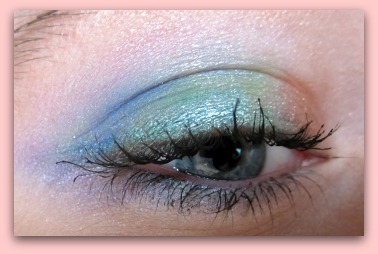 Add more bright eyeshadow color as necessary to deepen the hues. Next, take your clean blending brush and use it to blend between the lines of color until all shades flow evenly into the next. It is a good idea to wipe your brush before moving on to the next color. This will keep the colors from bleeding onto each other. Lastly, apply mascara and curl your lashes if necessary. You can even add a thin, smudgy line of eyeliner if you prefer a more defined look. Have fun with your creation, and don’t be afraid to switch up the bright eyeshadow colors or add accessories to make it perfect!